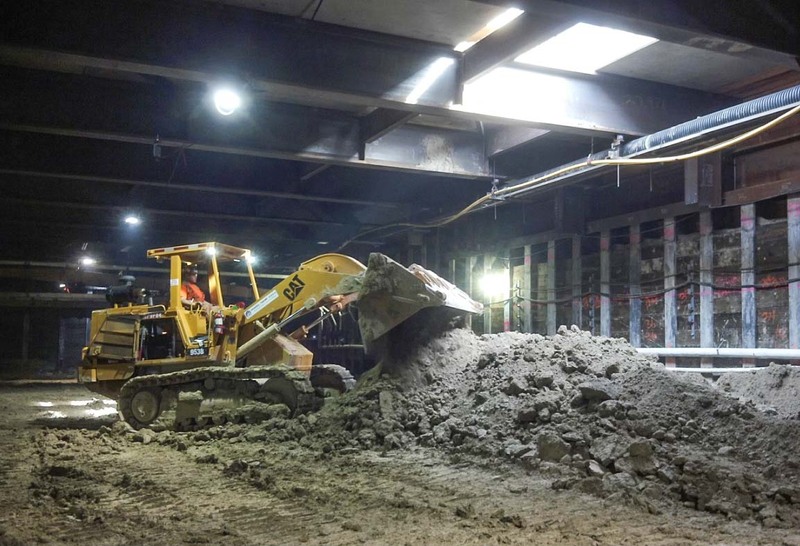 When is the earliest the Purple Line Extension will open? Metro CEO Phil Washington has said that the agency is aiming to open the entire project to Westwood by 2024 — in time for a potential Los Angeles Summer Olympics. 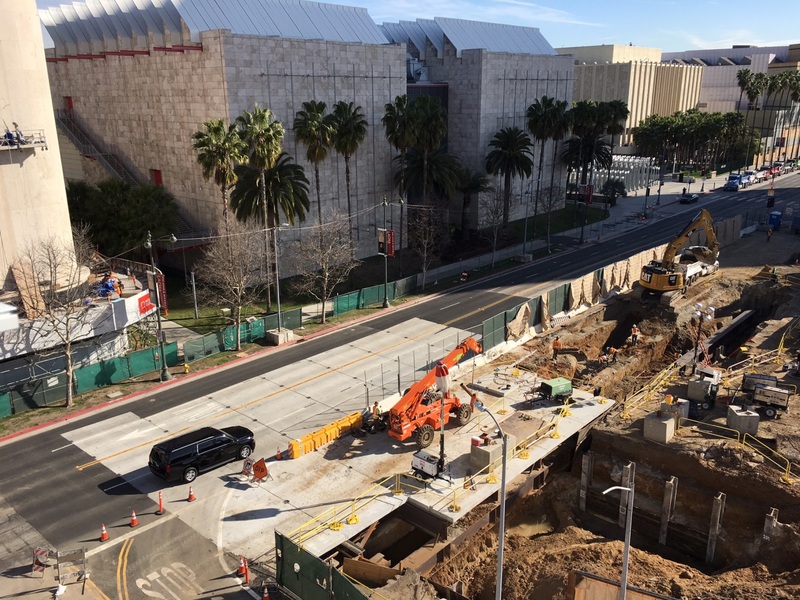 Section 1 of the project is under construction and will extend the subway 3.9 miles from its current terminus at Wilshire/Western to Wilshire and La Cienega boulevards (with stations at Wilshire/La Brea, Wilshire/Fairfax and Wilshire/La Cienega). Metro just gave the ‘notice to proceed‘ for section 2 of the project that will extend the subway another 2.6 miles to Century City with stations at Wilshire/Rodeo and Avenue of the Stars and Constellation Boulevard. The agency is also working on securing the federal funding that will be matched with local funds to build section three to Westwood. Jet grouting reinforces and strengthens the soil with concrete to support tunneling and cross-passage construction. 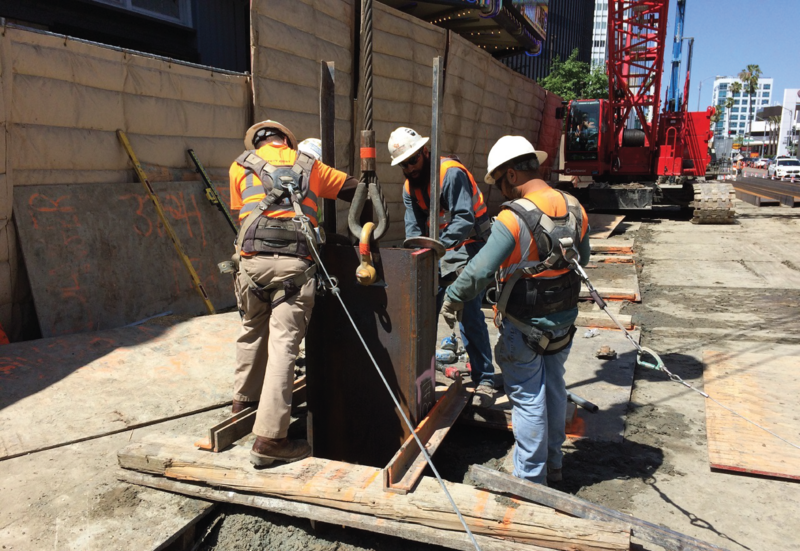 Jet grouting at Wilshire/Western will be completed this month. How many cubic yards of soil has been excavated at Wilshire/La Brea so far? Moving soil at the Wilshire/La Brea excavation site. Photo: Metro. Approximately, 60,000 cubic yards at the Wilshire/La Brea station — that’s a little over 1,385 shipping containers full of soil. A typical shipping container volume is 1,169 cubic feet or approximately 43.30 cubic yards. The contractor, Skanka-Traylor-Shea, has a number of approved facilities around our region to receive the soil. Metro encourages recycling or reuse of excavated soil when possible. Decking for the Wilshire/Fairfax Station in front of LACMA. Photo: Metro. Decking replaces the street and sidewalk with temporary concrete deck panels. The temporary surface allows construction to continue underground while traffic continues to flow while maintaining access to sidewalks and driveways. Decking has been completed for Wilshire/La Brea Station and is currently underway for the Wilshire/Fairfax station with completion on track to be completed in early June. Will the piles currently being installed at Wilshire/La Cienega be removed when the station is complete? A pile being placed at the Wilshire/La Cienega Station site. Photo: Metro. During pile installation, 70 to 90 foot holes are augured along the perimeter of the station box. The piles, inserted into those holes, become a permanent part of the station structure. Bonus question! When’s the next community meeting? The Purple Line Extension Transit Project will be holding a Construction Community Meeting on May 18 at SAG/AFTRA, located at 5757 Wilshire Blvd., Los Angeles, 90036. The meeting will be from 6 p.m. to 8 p.m. and offers another venue to have your questions about the project answered. The Purple Line Extension’s home page is here — with links to fact sheets, environmental studies and more. You can also follow the project on Twitter and Facebook. The Hollywood + Vine bike hub is opening Friday! So interesting….. really appreciate the information you are providing! Keep it coming!! Please…..Are they still planning to tunnel under Beverly Hills High School? It looks to me like that dip down to the Century City station bypasses the high school to the south just a bit. It passes just under the north side of the campus, which was enough for the city to wage a long, expensive legal battle that they finally lost several months ago. 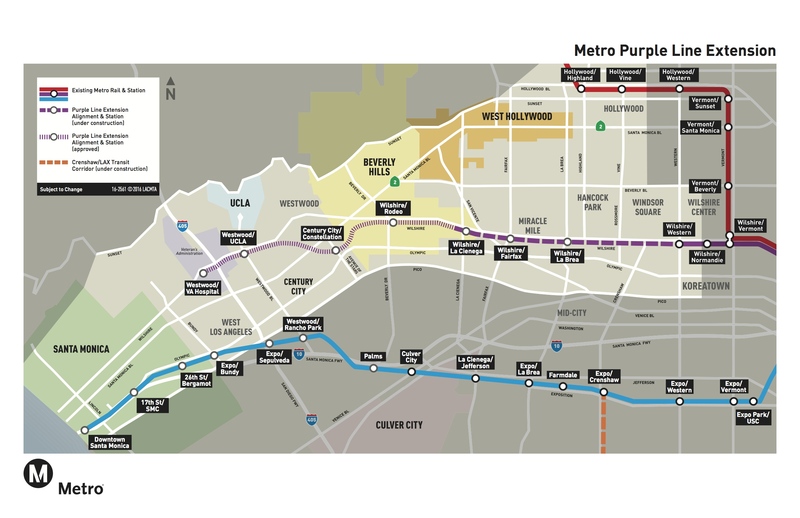 A question that I have not seen addressed anywhere is if Metro will open the Purple Line for travel west of Wilshire/Western in segments as stations are completed or wait until the an entire phase (or extension in its entirely) is complete to travel beyond the Western station. It’s likely the entire section will open at once — as has been the case in the past (the one exception was the Expo Line opened to La Cienega/Jefferson a couple months prior to opening to Culver City due to work that needed to be completed at CC). The basic reason is that it’s more difficult to only open communication/electronics/signaling system one station at a time and the work on such systems impacts all stations. Things can always change, but I think it’s far more likely the section will open all the way to Wilshire/La Cienega. Thanks for the reply. I was curious because I remember parts of the Red Line opening in pieces… I know travel to North Hollywood did not occur until some time after the Red Line had begun operating and if I recall correctly, I think the trip to Universal came later as did the trip to Wilshire/Western (of course before the line was split into Red and Purple). If the reason behind the subway system is to bypass traffic for travelers and relieve street congestion, I personally believe Metro can immediately begin to combat traffic the further along Wilshire the extension extends as each station is completed. And as each new station opens, the success of the line will see dramatically increases in riders. It would seem like a waste to sit on something and wait when you can begin the attack with noticeable results. Are there any plans to open infill stations in the future? That’s an awfully long distance (by subway standards) between Wilshire/Western and Wilshire/La Brea, as well as between Westwood/UCLA and Century City. No plans. A Wilshire/Crenshaw station was looked at as part of the environmental study process for the project but it was ultimately decided that it was too close to Wilshire/Western to justify. Overall the project will have seven stations spread out over nine miles — there are certainly gaps but bus service is pretty good in the area and this will allow the train to be fast — and that’s important in terms of attracting and keeping riders. The final two stations are relatively close (Westwood VA and Wilshire/Westwood) but are divided by the 405 freeway and we think both stations are important. Wilshire/Westwood is the gateway to Westwood Village and UCLA whereas the VA Hospital will obviously offer access to an important destination (the VA medical campus) and serve as the terminus and gateway to the Westside that is west of the 405. The same can be said of Wilshire/Normandy, it’s too close to Wilshire/Western. What a shame and Metro constantly ask voters for more money! Why not extending all the way to the sea? They want to, but they are constantly delaying it. It would be nice if Metro were to be a lot like other transit agencies that actually buildy daily much faster. Montreal recently built six stations in over the last 3 years.